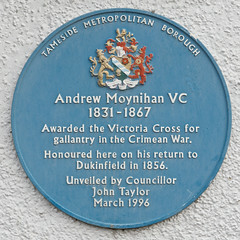 Andrew Moynihan, VC (1 January 1830 – 18 May 1867) was an English recipient of the Victoria Cross, the highest and most prestigious award for gallantry in the face of the enemy that can be awarded to British and Commonwealth forces. 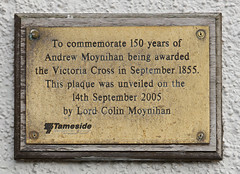 He was born in the Saw Yard, Wakefield, Yorkshire on 1 January 1830, the son of Malachi and Ann (née Scott) and was Baptised at the Catholic Church of St Austin in Wakefield on 14 March 1830. Moynihan was a 25-year-old sergeant in the 90th Foot, British Army during the Crimean War when his gallant action took place on 8 September 1855 at Sebastopol. Sergeant Moynihan, who was with the storming party at the assault on the Redan in the Crimea, personally encountered and killed five Russians, and while under heavy fire also rescued a wounded officer from near the Redan. Moynihan was promoted to sergeant major and in 1856 was commissioned into the 8th Foot. He was promoted lieutenant the following year and captain in 1863. He died after contracting Malta Fever, caused by drinking unsterilised goat's milk. He is buried in La Braxia Cemetery and his Victoria Cross is displayed at the Cameronians Regimental Museum in Hamilton, Lanarkshire, Scotland. His son became a prominent surgeon being raised to the peerage as Berkeley Moynihan, 1st Baron Moynihan.